It’s that time of the year. I can feel my bones stirring, getting ready for new beginnings. It’s that wintery feeling that comes when we get ready for the spring and summer to warm us up and get us out into the world again. In SoS terms, it’s the “January Gathering” time of year when we get together to plan our projects and programs for Summer of Solutions and all of our solutionary endeavors. And though I didn’t go to the January Gatherings this year, I still feel that sense of stirring, beginnings, and excitement. It is time to connect with people around us, to share ideas, dream up new possibilities, and get ready to grow in new directions. As Solutionaries around the country organize and prepare for their Summer of Solutions programs, I’m getting ready for a new Solutionary launch of my own. 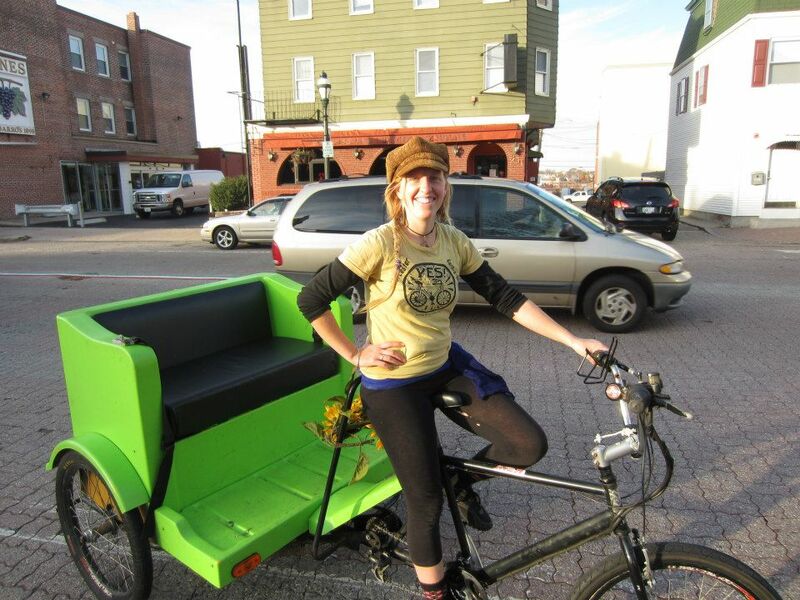 This spring I will be rolling out Sol Chariots Pedicab Cooperative, a worker-owned and operated bike taxi service in Providence, RI. I’ve been organizing with my fellow founders and worker-owners to plan and prepare to kick off this spring with our self-created green jobs that sustain us while providing sustainable transportation in the city we live in. I’m super excited to be building my own job and creating a workplace that is autonomous and democratic, as we redefine work and the workplace in a way that is in line with our values. This past month we successfully completed a grassroots investment campaign to raise $5000 that reminded us of the community of support we are opening with and how powerful a cooperative economy can be. The Sol Chariots Pedicab Co-op Launch video is up on Vimeo. Check it out! As I get ready to roll, I can’t help but think back to the path that has lead me here and how much I learned from my experiences organizing and working with Summer of Solutions. I am a Summer of Solutions alumnus and still a Solutionary. 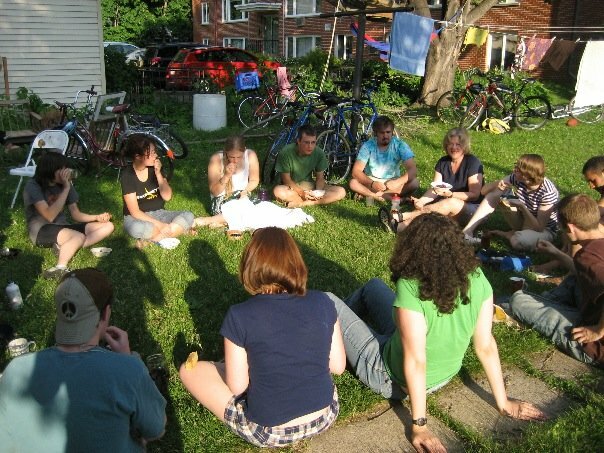 I attended the first-ever SoS program in 2008, with Emily Stiever (whose post you can read here), and saw it as a full-fledged “leap of faith” into a whole new type of organizing and learning experience. Emily and I were 2 of 4 people who came from outside the Twin Cities to partake in a summer of community-based organizing for solutions to climate change. When I flew out to MN that summer; I really had no idea what I was getting into. I learned that I could grow so much through taking leaps. To me, that means recognizing how much we can learn and grow by taking risks and putting ourselves, full-heartedly, into new experiences. The program was so new and so groundbreaking that the group of us who were committed to participating made it our own and grew so much through the process. Through my work with Cooperative Energy Futures, I learned about what a cooperative business is and what goes into starting one. As we worked, we had to figure out how to make our ideas and aspirations a reality, and a lot of that felt like trail-blazing new experiences. The friendships I built that summer are still so important to me and are people I see as my peers in charting our paths forward. Summer of Solutions gave me the skillset (and the resumé) to feel like anything is possible for me. That summer truly opened up an array of opportunities in my life. From there I went on to be a Program Leader of Summer of Solutions in Worcester, MA in 2009 and 2010, diving into a whole new set of organizing skills that I had yet to develop. From my experience in SoS Twin Cities and SoS Worcester, I learned how to have creative confidence, which to me is being willing to put yourself and your ideas out there, boldly, knowing that you have the skills and resources within yourself and your community to make it a reality. I found that when I was acting with passion and letting that show, other people around me were so jazzed by what I/we were doing that they would participate, contribute, collaborate, and help it grow. 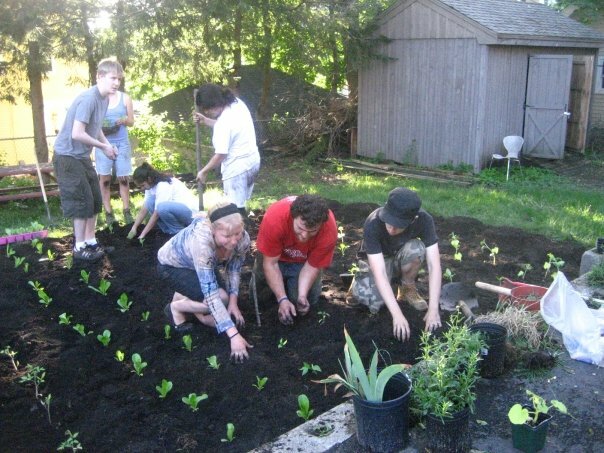 Because of that, we had incredible programs opening community gardens in Worcester, building a movement for just, green jobs, and starting up a grassroots weatherization program that mobilized hundreds of people. Yeah, sure, we hit roadblocks along the way, but the solutionary way of thinking we had learned in SoS allowed us to see possibilities and potential, not closed doors. And last, with this growing experience in community work, I learned the importance and value of relationships, collaboration, and cooperation. In my first SoS program, I learned so much about being an attentive and responsive community organizer who knows how to have reciprocal relationships and work in solidarity. In Worcester, I learned so much by having one-to-one conversations with other community organizers in the city who were part of organizations or already existing projects, and by collaborating and working together. That has been so important in this new endeavor of mine. I know that in starting a cooperative business, I want to build new types of relationships between workers, between our business and our customers, between other businesses and organizations in the city, and I would even go as far to say, new relationships between humans and the environment we live in. There is so much potential for what is possible if we can redefine those relationships to be ones of solidarity and support, collaboration and cooperation, trust and care. I am so grateful for my experience with Summer of Solutions through the years. Because of it, I feel that so much is possible in my life and the world. I have a whole set of skills that I can apply wherever I go and I have already seen the immeasurable ways it has made my life so fulfilling. And it means so much to me to have a way of working and sustaining myself financially that is in line with my values and creates more value in my community. I am really excited to be taking a new leap for myself this spring as I ride out into the streets of Providence with my new project. I hope you will join me and take a leap for yourself into something that opens boundless possibilities for you as you work on sustaining yourself and sustaining the world. And if you’re not sure what your next leap is, I highly consider checking out this one: Summer of Solutions 2013. This entry was posted in Alumni Spotlights by ashtrull. Bookmark the permalink.